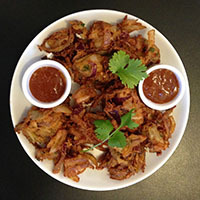 This Gluten Free Onion Bhaji is probably one of the tastiest I have ever eaten, its not a simple recipe but well worth it. Melt the butter (10 seconds in a microwave will do the trick) and add it into a mixing bowl with the the onions, green chilli, garlic and the ginger. Add the chilli powder, turmeric powder, gram flour, coriander, fennel seeds and a sprinkle of salt. Mix well with your hands, adding a little water if required to ensure the mixture loosely holds its shape. Drain on some kitchen towel and serve whilst still piping hot.